This fruit game promises opulent gaming entertainment. 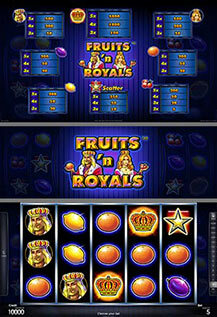 The top symbols Crown, King, Queen and scattered Star make "Fruits ’n Royals™" a very special gaming treat for great gaming fun and royal prizes. All prizes are for combinations of a kind, left to right except scatter.